Planning a beautiful childrens birthday party with merfolk and underwater themes. 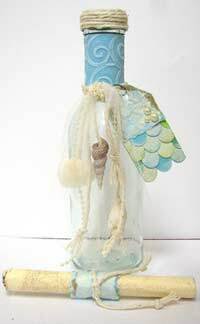 We'll explore a few ideas to set the theme for your magical celebration starting with ideas for homemade under the sea inviation. Head down to the beach and find some large sea shells. With a permanent marker, write down the party details directly on to the shell. Hand out the invitations to your guests. If you want to past them be sure to wrap them in bubble wrap so they remain intact. If you want you can buy the shells from a craft or hobby shop. 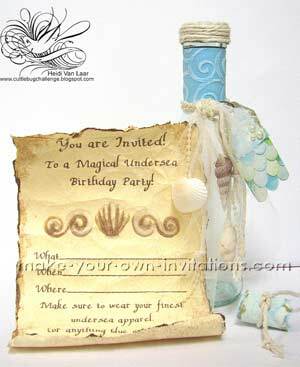 Cut your mermaid shaped invitations from white construction card and print the details onto it. Make a message in a bottle. Decorate your handmade invitation with 'the little mermaid' stickers. Scatter a bit of sand in your envelope when you post your invites - this could get a little messy though. Take a photo of the birthday girl (or boy) in their mermaid costume and create a photo invitation in photoshop elements or similar program. The bottle is about 7" tall and is actually a recycled mini wine bottle. It has a screw top, so I disguised that by wrapping cotton cord around the cap. I added and embossed strip of cardstock to the neck and then further embellished with the fibers, pearls and shells. The final addition was the tag with the recipients name is on the reverse. The invitation itself is about 5x7" and was created on the computer and then printed onto a parchment type paper, then I inked and distressed it within an inch of it's life. The finishing touch is a wrap made of cardstock and tied with cotton cord. Hot tip: It is important to tie the invitation after it is rolled up so it can be easily removed from the bottle. These are easily passed out by hand, but if mailing is necessary a mailing tube cut down to size works wonderfully!